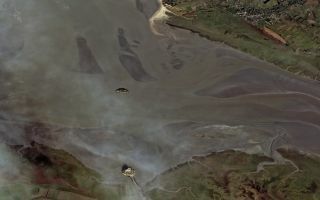 This image from the Pleiades satellite shows the island of Mont Saint Michel and its surrounding bay in northwest France. This cool space wallpaper from the Pleiades satellite shows the island of Mont Saint Michel and its surrounding bay in northwest France. It was taken May 3, 2012. Mont Saint Michel was a tidal island, meaning that it was surrounded by water at high tide and only when the waters receded was it reachable by foot. In the late 1800s, the causeway was raised to make it accessible from the mainland at all times. In this image, we can clearly see where the water meets the mud flats, with multiple channels weaving through the mud.